The picture below shows the interior of a ”stock” Vivitar 283 module. You can see the two contacts that are “shorted” (soldered together). You can also see the two contacts that will be connected to the resistors, the ones with the red and black wires attached. (This picture is from the standard 283 sensor that included a photocell for “automatic exposure”. When used solely with resistors, there are no “polarity “ concerns). Note that there is a 200pF capacitor across the leads to the variable resistance. Prior to using 283’s for microscope illumination I had used them for many years for other “high speed” photography projects. 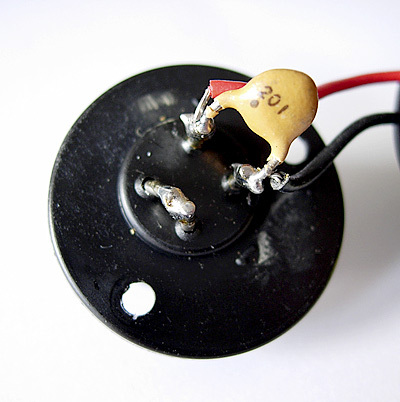 The controls I used for those projects did not have this small capacitor, and they worked fine. Since Vivitar made their modules with this component in place I assume there was a reason... so I incorporate it in my modification. Note: As mentioned above this flash model was made for many years. The earlier models had a high voltage across the sync terminals. The voltage levels are too high for some of the newer electronic cameras, and could seriously damage these cameras. Units that were made later in the products life span had a much lower, safe, sync voltage level. While units manufactured in Korea or China are often said to be safe for all cameras, I would err on the cautious side. If you have the proper meter and knowledge to check the unit you will be using, you can measure it and compare the results to your camera specs (if you can find them!). A worry-free way to incorporate older electronic flash units with modern digital cameras is to use a device such as a Wein "safe-sync" (or a Paramount Vivitar sync cord with “voltage protection”) that insures the sync voltage is sufficiently low so as not to damage the camera electronics. Of course, a flash can always be safely "fired" using a flash slave unit, with a camera manufacturers flash on the camera (or built-in camera flash if present) set to a very low setting. 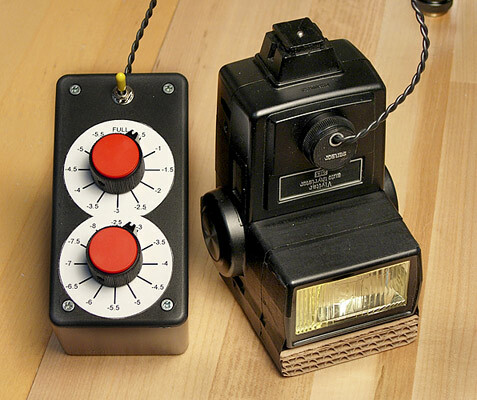 The picture below shows a finished “control box” and a flash unit. I have used two 12-position switches. The upper switch provides setting from “FULL“ to “-5.5 stops”. When toggled to the lower switch, the power settings go from “-2.5 stops” to “-8” stops”. Having exact, discrete positions for ½ stop increments has worked nicely. The center contact is not used. The two contacts on the left side of the picture above, one at "10 o'clock" the other at "8 o'clock" must be connected ("dead short") to each other. My desire to photograph active, live subjects through the microscope necessitated the use of electronic flash. 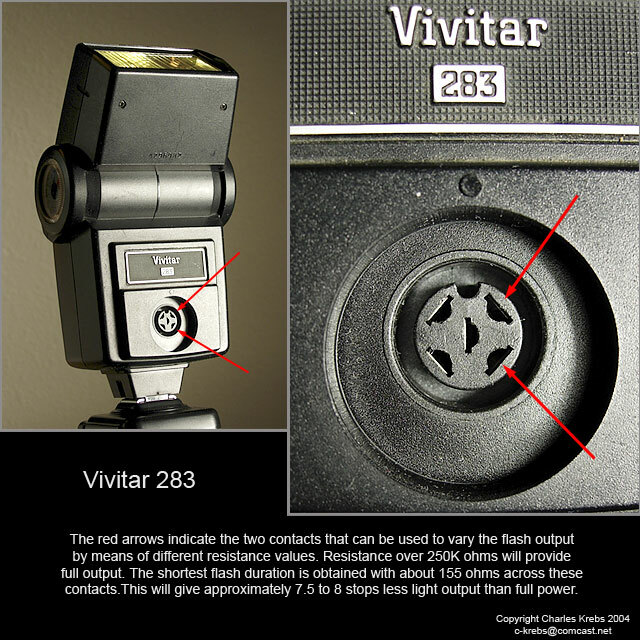 This page does not cover the method used to implement the flash illumination on the microscope, but provides information about controlling the light output (and as a result the flash duration) with the Vivitar 283 flash unit. If you wish to see how the flash unit was incorporated into the microscope illumination see the page on my current setup, as well as an earlier implementation. I settled on using the venerable Vivitar 283 primarily because it allows easy and remote (via wire) setting of power levels. The lower power levels give very short flash durations that have great motion stopping ability. I had tried using a TTL flash unit, but found I wanted to make + or - adjustments fairly often, and the location of the flash and camera made this cumbersome. With the feedback provided by digital cameras (histograms, image review) manual flash is not a problem, in fact it has become my preferred method. The Vivitar is now a “discontinued” model, but it had been made for a very long time, were (are!) extremely popular, and there is an ample supply on eBay and in the used equipment cases of many camera stores. Vivitar made a “VariPower” module for this flash, and they also made a remote cord so that this module could be used some distance from the flash. The VariPower is nothing more than a simple (but custom) variable resistor. I have always found the VariPower hard to reset to exact values, or in small increments. It was intended to plug into front of the flash, so it is necessarily small. The adjustment is non-linear and at reduced settings a small movement of the dial makes a large difference in the resistor value. When incorporated into a microscope setup, it is highly advantageous to have a larger control control “box” with exact, repeatable positions. The tabletop control shown below has discrete, ½ stop increments and has worked superbly. The picture below shows the two contacts on the front of the unit that are used to change power levels. You only need to vary the resistance between these contacts. The control box I now use is set up using multi-pole switches with discrete resistor values at each switch position. To determine the values for the resistors, four Vivitar 283's (all were "used" units) were carefully tested. Using a Sekonic flash meter, the resistance values required to decrease the power in "stops" were determined. There was a small difference from unit to unit. The values listed here are the average, and they have proven to work well.